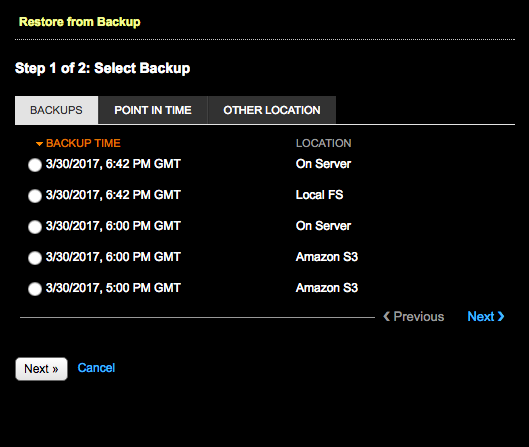 Note: On Server backups are not eligible for cloning. The Restore from Backup: Step 2 of 2 dialog appears. 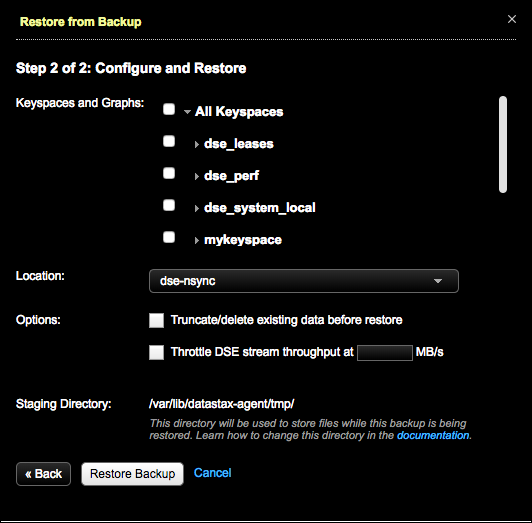 In Keyspaces and Graphs, select the tables or graphs included in the backup you want to restore. Click the keyspace name to include all the tables in the keyspace. Click All Keyspaces to restore all the keyspaces. To select only specific tables, expand the keyspace name and select the tables. Click the graph name to include all the graphs in the keyspace. Click All Graphs to restore all the keyspaces. To select only specific graphs, expand All Graphs and select the graph keyspaces. When cloning data, it is not necessary to select the Truncate/delete existing data before restore option because it is a no-op for a cloning workflow. The truncate option purges data on a target before a restore runs. When using the restore feature to clone, the truncate option does not do anything because there is no data to purge before the restore runs. To prevent overloading the network, set a maximum transfer rate for the restore. Select Throttle DSE stream throughput at ____ MB and set the maximum MB per second. Optional: Change the staging directory if necessary by setting the backup_staging_directory configuration option in address.yaml. 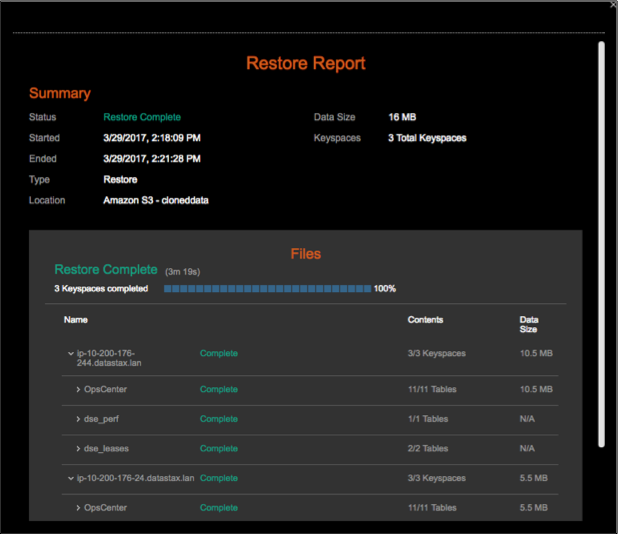 The Confirm Restore dialog appears. Warning: If a value was not set for throttling stream output in 8, a warning message indicates the consequences of unthrottled restores. 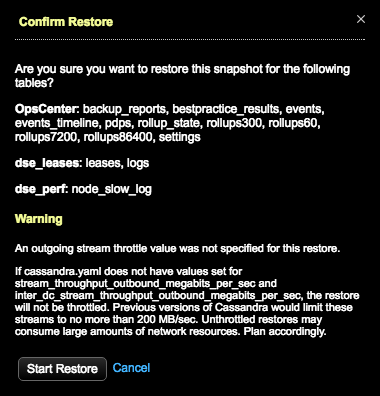 Either click Cancel and set the throttle value in the Restore from Backup dialog, set the values in cassandra.yaml (stream_throughput_outbound_megabits_per_sec and inter_dc_stream_throughput_outbound_megabits_per_sec), or proceed anyway at risk of network bottlenecks. 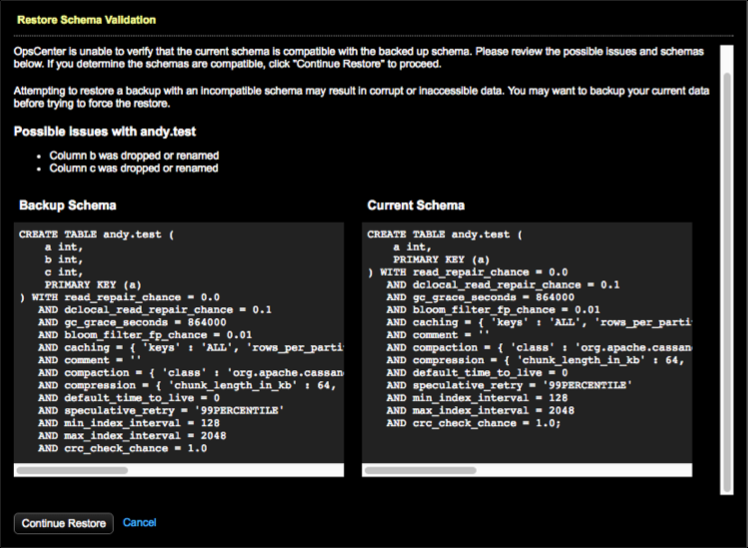 Tip: If you are using LCM to manage DSE cluster configuration, update Cluster Communication settings in cassandra.yaml in the config profile for the cluster and run a configuration job. Stream throughput (not inter-dc) is already set to 200 in LCM defaults. Click Start Restore to confirm the restore.